German car manufacturer Audi AG, the premium brand of Volkswagen AG, on Wednesday opened up the $1.2 billion expansion of its car manufacturing plant in Gyor, Hungary, where it is launching the mass production of its new premium compact A3 saloon model. The Gyor site, belonging to Audi AG’s Hungarian subsidiary Audi Hungaria Motor Kft., is already the biggest car engine plant in the world, supplying engines for nearly all the Volkswagen models. 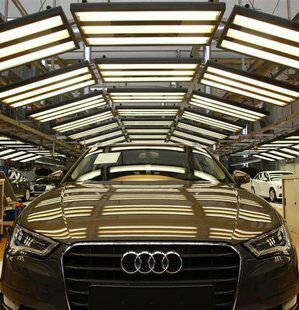 In the first quarter of this year, Audi built 7,184 units of the TT car line and A3 family at the plant. With the A3 Sedan, Audi is introducing a new concept in the premium compact class, one of the world’s fastest-growing car segments. Demand is increasing sharply in this segment in major growth markets such as the United States and China. The A3 Sedan will be launched in those countries in the spring of 2014, and will be available from European dealerships as of this autumn. The dynamic four-door has all the strengths of the A3 model range: low weight thanks to lightweight construction, strong and highly efficient engines, as well as numerous high-end systems for infotainment and driver assistance. The new Audi plant will make the marques A3 Limousine, the A3 Cabriolet, the TT Coupe and Roadster. Gergely Suppan, an analyst at Takarekbank said once at full capacity, Audi could boost Hungary’s economic output by about 1 percent. The expansion would allow the firm to manufacture up to 500 model A3 Limousines a day, or some 125,000 cars a year, Audi executives said in a press release.